Sugars, fats and carbs love to hide in foods disguised or packaged as “healthy.” Read on to discover what snacks you’re eating that you shouldn’t be! 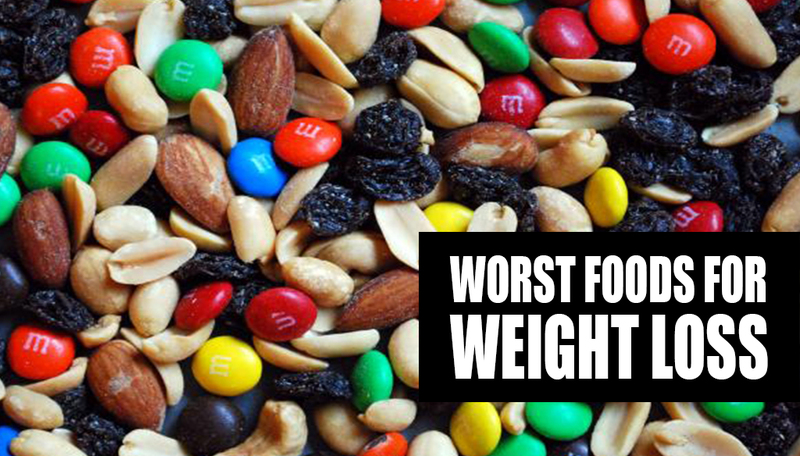 A serving of store-bought trail mix is a measly quarter-cup, a serving size that roughly no one will stick to. Plus, the processed milk chocolate isn’t doing you any favors, either. Instead, go for some fruit and nut bars like KIND bars, or you could make your own. These classic snacks are high in sodium — almost 20 percent of your daily intake is in one serving of pretzels. Too much sodium leads to increased water retention, which can lead to bloating and puffiness, and too much sodium over time can lead to heart disease. Opt for some salted and shelled pistachios instead. Artificial sweeteners can make you feel full and keep cravings at bay, but they also have a negative effect on your metabolism. Eliminating diet soda (and caffeine) can be difficult at first, but in the end is completely worth it. Try drinking sparkling flavored water or detox waters instead. Rice cakes are commonly perceived as healthy foods because they are low in calories and contain no fat, but they are also incredibly high on the glycemic index. Pure sugar has a rating of 100, and rice cakes have a rating of 82. Try air-popped popcorn (not microwaved) for a healthier alternative. Bottled smoothies may seem like a good low-calorie choice, but upon closer inspection, there are usually two or three servings in one bottle. Making your own smoothies is the perfect way to ensure that you know exactly what is going into them and how much you should drink to stay on track. Banana chips also may seem like a good idea, because they are primarily bananas. Right? Wrong. They are usually fried, which means they are high in saturated fat. Instead, go for the obvious substitution here: a banana! A chocolate pudding cup doesn’t have terribly high calorie count, but why not just go for the real deal instead? Dark chocolate contains antioxidant-rich cocoa and contains less sugar, less carbs and more fiber than a cup of chocolate pudding.